"Bayside House" is the work of Elizabeth "Betty" Everett Smith, daughter of Helen Addison Everett, former Humboldt State College Librarian for whom the second-floor reading room in the Library is named. Born on July 22, 1928, Ms. Smith was an alumna of Humboldt State College, B.A. Art 1950. She lived for more than 20 years in Mendocino and loved to read, paint, and look at the ocean from her home on the coast. As a retired librarian, she volunteered at the Mendocino County Library and traveled to many countries with painting and choral groups. 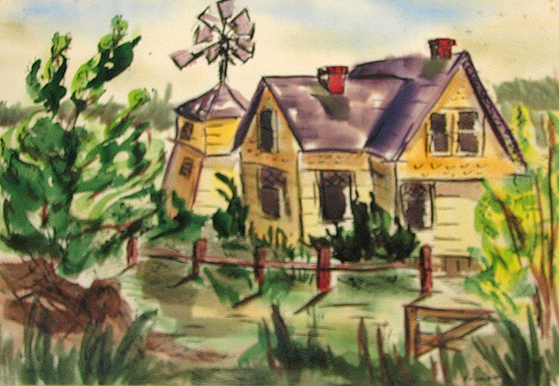 "Bayside House" was donated to the Humboldt State University Library by Lauchlan Jean, Betty Smith's daughter, during a memorial service held on June 4, 2006, to commemorate Ms. Smith's death on February 19, 2006.